Another Sunday, another Sunday Roast in Chislehurst, Bromley. This time round, we settled on The Bull’s Head. Claire and I have been here previously, we watched an International Rugby match on TV when we were viewing flats before we moved. Last time we were here, we ate in the saloon bar area, this time I wanted to have Sunday Lunch in the restaurant, The Grill. I phoned up about an hour beforehand to reserve a table in the restaurant. 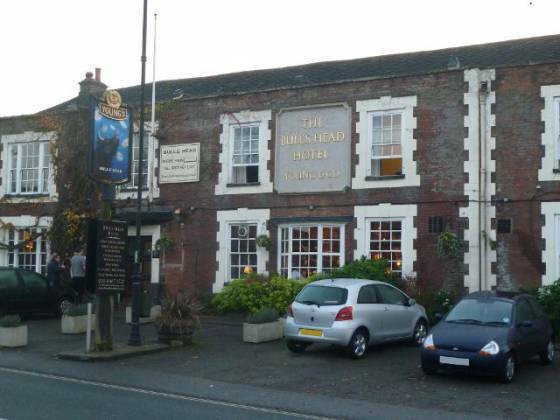 When we arrived at The Bull’s Head, we grabbed a quick drink at the bar and then made our way through to The Grill. We were greeted at the door by quite a jovial guy who showed us to our table and offered to take our coats. Our table was positioned next to the window, which had wooden blinds. The room itself had a fresh feel to it, with wood panelling on some of the walls, wood flooring and light walls. The table was nicely laid out, with linen napkins. I felt very much at home here. When I asked about a bottle of red, the manager (I believe, he was also our waiter and maitre d’) actually recommended a new wine that was cheaper than their house! It would have been rude to say no… We were also brought table water in a nice glass litre bottle. Our Sunday dinner came our shortly afterwards (the optimum time – 15 mins) and was very well presented. 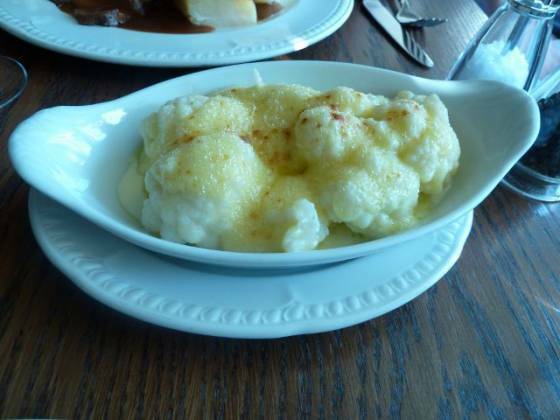 But, the pièce de résistance had to be the cauliflower cheese – a very large dish with lots of melted cheese. Heaven. The plate consisted of three large thick slices of beef, three large roasted potatoes, broccoli and carrots. Also, a yorkshire pudding and lots of gravy. I was looking forward to this! After having to share some of the cauliflower cheese with Claire, I tucked in. I have to say, this was an excellent meal. The Roast Beef was cooked medium-well, the potatoes were great – very nicely cooked, the vegetables tasted very fresh, the yorkshire was nice and crispy (almost like a muffin), gravy flavoursome without being overpowering and the cauliflower cheese – what can I say? The best I have ever had outside of home made. After about 5 minutes out came my dessert, looking extremely nice. But, what’s this? 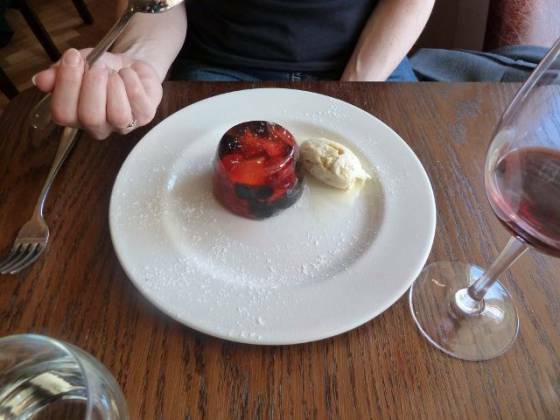 The manager also had another dessert, the jelly and ice cream for Claire (‘it’s on us!’). What a very thoughtful gesture. And, I have to say, the jelly was very nice (I felt bad that Claire was full up and may not be able to eat it all). 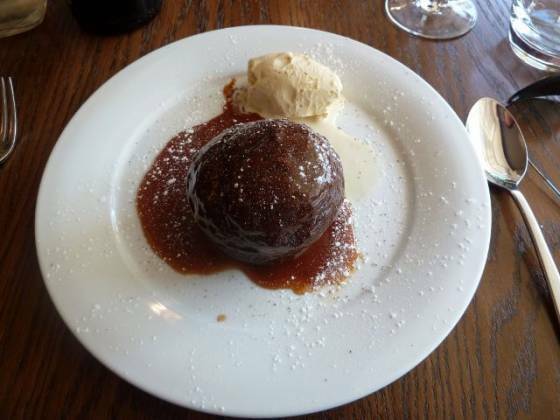 My sticky toffee pudding was also very much up to scratch. So, this review needs wrapping up. 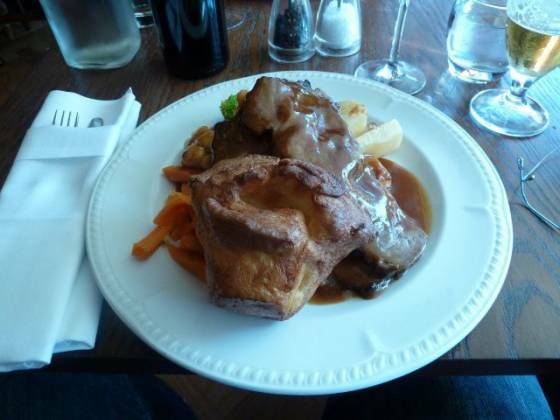 I have to say this has been one of my best experiences with eating out, let alone on BestSundayroast.co.uk. The service was impeccable, the food quality and presentation was excellent and the venue fantastic. It has so many facets, from a ‘lounge bar’, saloon, restaurant and even rooms. If there is one place you need to visit for lunch, this is it. The Bull’s Head, thank you! You have well deserved Top Rated, 5 plates. We’ll see you for our Christmas Lunch in December.